The DEWALT Small Trigger Clamps easily convert to spreaders when needed. The removable jaw pads help to protect work surfaces. With a tough re-enforced nylon body, these clamps are Guaranteed Tough. Comes in a 2 pack. 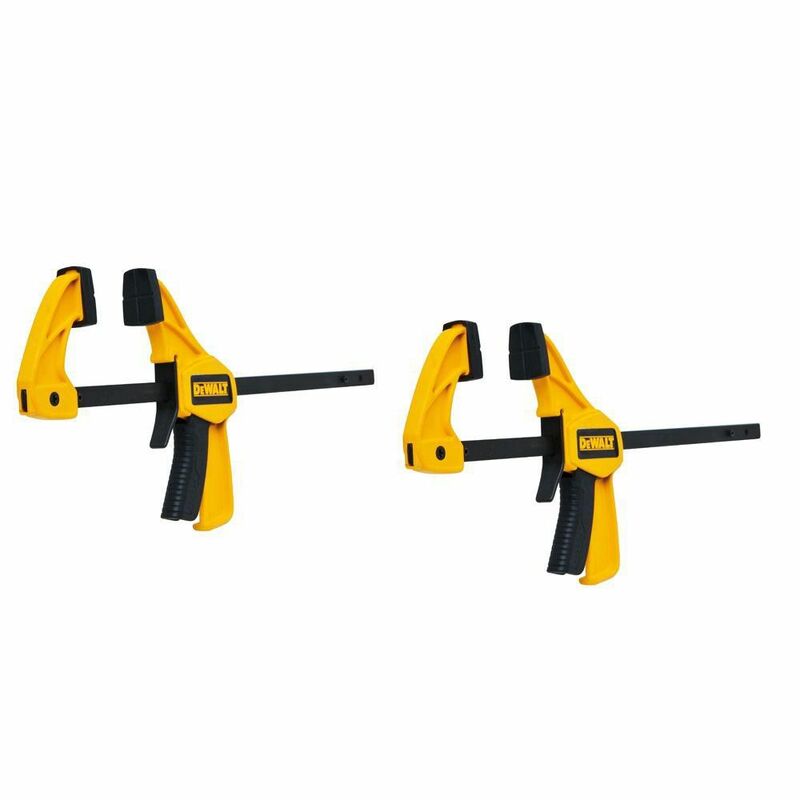 4.5-Inch Small Trigger Clamps (2-Pack) The DEWALT Small Trigger Clamps easily convert to spreaders when needed. The removable jaw pads help to protect work surfaces. With a tough re-enforced nylon body, these clamps are Guaranteed Tough. Comes in a 2 pack. 4.5-Inch Small Trigger Clamps (2-Pack) is rated 4.4 out of 5 by 15. Rated 1 out of 5 by ArtVandelay from Not as advertised These clamps say they are 11.5 inches long, not true! I was disappointed when I opened the package, measured them and they are only 8 inches long. I've filed a claim as I ordered online and they don't match the product description. Rated 5 out of 5 by HOFFMANNZ350 from Very good!!!!... Very good!!!! Rated 5 out of 5 by Bob from These clamps are a far cry from the clamps I have used over the years. East to adjust, excellent ... These clamps are a far cry from the clamps I have used over the years. East to adjust, excellent force applied and quick release. What more can one want. Rated 2 out of 5 by Lindsay from Pretty cheap plastic. One already broke right when I used... Pretty cheap plastic. One already broke right when I used it the first time. Holds wood in place well though. Rated 5 out of 5 by Vince from These clamps are easy to use with one hand and hold the work piece in the other hand. The stat... These clamps are easy to use with one hand and hold the work piece in the other hand. The stationary jaw is more durable than a similar clamp I have made by another manufacturer which broke and was the reason why I purchased these two camps. Rated 5 out of 5 by Doc from These clamps filled the bill for the purpose intended. Be aware that these are not high torque c... These clamps filled the bill for the purpose intended. Be aware that these are not high torque clamps and are not designed to be used for large glue ups, but to be used just to secure small pieces together like picture frame jigs. Rated 5 out of 5 by ZachZ from Excellent little clamps. I've used them several times already to... Excellent little clamps. I've used them several times already to repair some of my kids toys with outdoor adhesive. Why they are not sold as a pair in the store is beyond me. These fit nicely into that kitchen junk drawer, and would make an excellent stocking stuffer!